We are leading manufacturer, wholesaler and exporter of Heavy Duty Springs. We are a coveted manufacturer, wholesaler and exporter of optimum quality Heavy Compression Spring. This spring is used in mechanisms that require a great amount of force to be exerted on the spring. Our offered spring is perfectly manufactured with the use of quality assured material and ultra-modern methodology under the stern vigilance of dexterous technocrats at our sound production unit. In addition to this, the provided spring is highly acknowledged for its easy. installation and fine finish. With honesty and hard work of our experts, we have carved a niche for ourselves in this domain by offering Heavy Duty Compression Springs. The offered springs find wide usage for many applications. These springs are manufactured making use of quality approved material and modern technology in tandem with predefined industry standards. 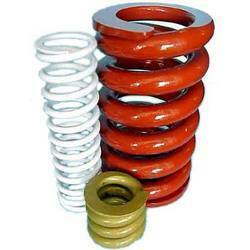 We offer these springs in different sizes to fulfill the needs of our esteemed clients. Heavy Duty Coil Springs are the only practical helper spring alternative when shock absorbers are mounted inside the coil spring and are an excellent choice for vehicles equipped with diesel engines or snow plows. Heavy Duty Coil Springs also require no maintenance making them an excellent load handling solution for fleet Vehicles, Pickups, Vans and Motor Homes. Our heavy duty coil springs improve the handling and ride quality of heavily loaded vehicles thereby reducing driver fatigue and increasing safety and efficiency. Looking for Heavy Duty Springs ?